Sick of queueing at crowded coffee shops to eat sub-standard local food and drink sub-standard local coffee? Coffee Hive serves decadent Singapore-style fusion food and tasty traditional-style coffee at affordable prices, and in a homely contemporary cafe setting. 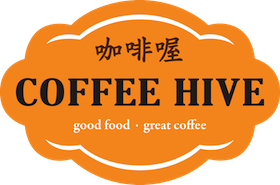 Coffee Hive’s first outlet at Robinsons Road was set up in 2012 by four enterprising young men, who wanted to provide a cosy spot with affordable local delicacies for common men working around in the area. Today, even its newest outlet at Novena Square 2 has office workers patronise during lunch hour. Having been the choice place for their friends and family to la-kopi (Hokkien for “get together for coffee), the four buddies also hopes that you can enjoy a unique kind of companionship at the humble spot with fantastic food and drinks.